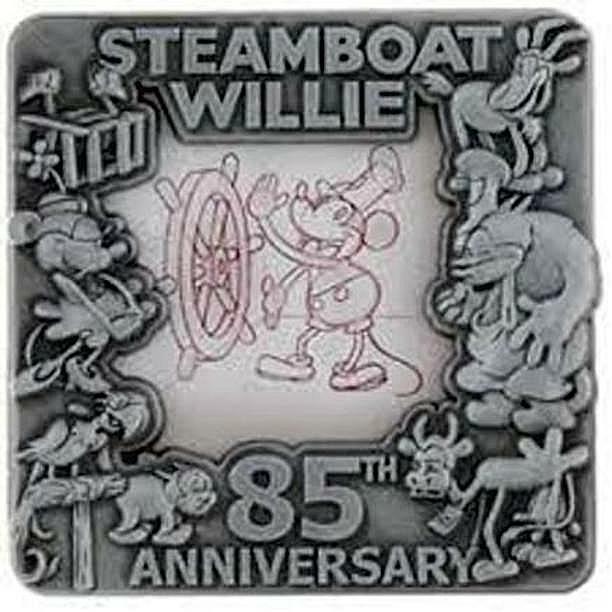 This pin has a silver colored frame with characters from the short movie around the pose of Steamboat Willie at the helm. 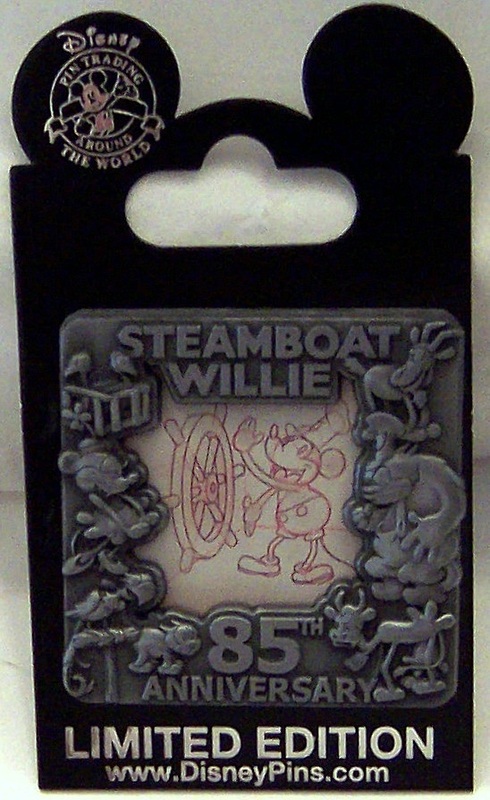 Noteworthy, this pin celebrates the 85th anniversary of the short movie. PIN IS ABOUT 1.75 H X 1.75 W INCHES MAX DIMENSIONS. 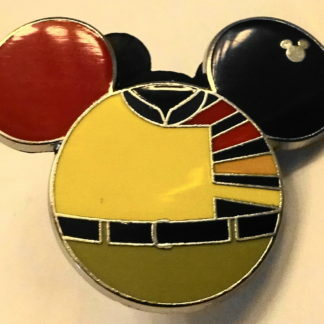 #1 POSTS WITH #1 MICKEY PIN BACK. Only 2500 of these pins were made worldwide!!! 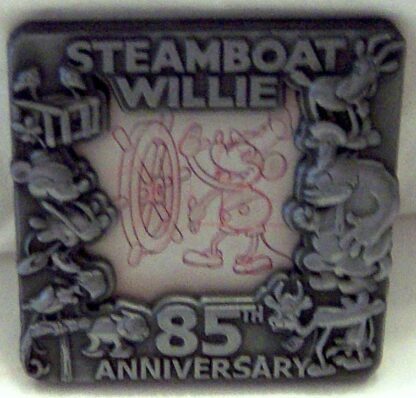 Buy this Disney Steamboat Willie 85th Anniversary Limited Edition 2500 Pin New to collect yourself. Or give it to someone you know! Limited Edition 2500 Pin New. 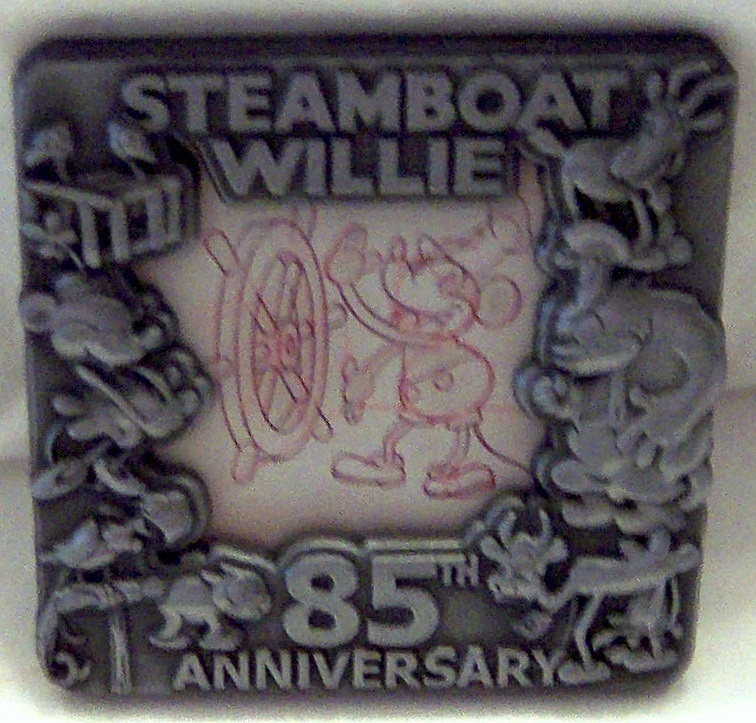 This pin has a silver colored frame with characters from the short movie around the pose of Steamboat Willie at the helm. Noteworthy, this pin celebrates the 85th anniversary of the short movie. 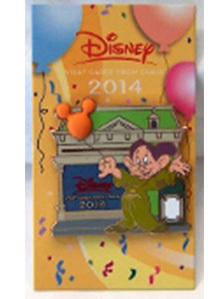 Further, the pin was released at WDW and DLR on November 14, 2013. ALSO, PIN IS ABOUT 1.75 H X 1.75 W INCHES MAX DIMENSIONS. 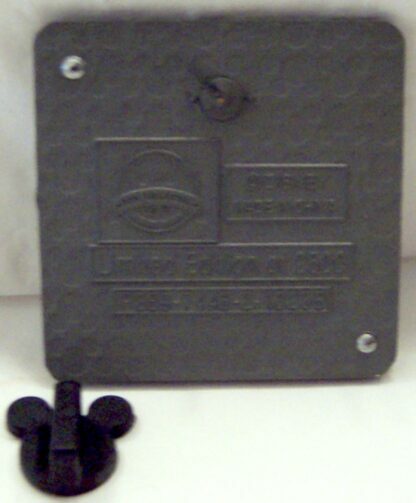 NEXT, #1 POSTS WITH #1 MICKEY PIN BACK. IN ADDITION, @DISNEY, MADE IN CHINA, AND RELEASED NOVEMBER 14th 2013 AT WALT DISNEY WORLD AND DISNEYLAND RESORT. 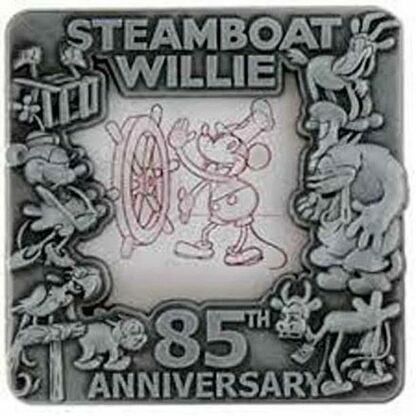 Disney’s Steamboat Willie is a landmark in the history of animation. Importantly, it was the first Mickey Mouse film released and the first cartoon with synchronized sound. It threw silent animation into obsolescence, and launched an empire. Previously, there had been little to distinguish Disney’s cartoons from those of his competitors. In fact, he was facing bankruptcy when Alan Crosland’s The Jazz Singer, with long sequences of song and dialogue, took America by storm in 1927. Sensing that sound movies meant big business, Disney decided to stake all on his talking mouse. Notably, the movie opened at the Colony Theater in New York on November 18, 1928, a date that would become known as Mickey’s birthday. 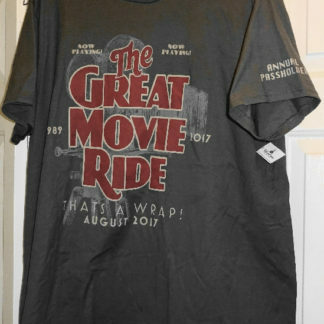 Noteworthy, Disney sells these items as new with minor imperfections. In addition, card and pin back may have minor shelf wear as sold by Disney. This includes rips, tears, folds, and/or creases. MOST IMPORTANTLY, WARNING: CHOKING HAZARD – Small parts and made in China. Thus item may contain lead and other heavy metals.